The print edition of “Overcoming Conflict…” retails for $10 PLUS shipping, but I’ve decided to GIVE you a copy. All I ask is that you cover the cost of printing, shipping, and handling (just $6.95), anywhere in the US and Canada. Please allow 3-4 weeks for delivery. A practical guide of 16 steps to implement positive change in your church or Christian ministry. Charts and Bibliography included in this valuable PDF reproducible manual. Luke’s account of choosing the Seven in Acts 6 is a story of the Apostles’ innovating for the sake of resolving church conflict and restoring ministry effectiveness. This is exactly what the title describes. Is it possible you're unintentionally using "GLADIATOR TACTICS" to solve church conflict? Hi, this is Dr. Randal Gilmore. I've spent the last 30 years studying conflict resolution in ministry settings. And what I've found is that many of the things we were taught to do during conflict turn out to be GLADIATOR TACTICS that KILL ANY CHANCE AT PEACEMAKING. You can discover which conflict resolution tactics are GLADIATOR TACTICS and stop using them. And even better? I'm going to share them with you for FREE! But first, I'll never forget my first experience with church conflict nearly 40 years ago. I was a young, newly minted pastor of a small congregation. Our church had outgrown the building we were renting, so we began searching for a property of our own. It was the best of times, and everyone seemed happy. But then one of our members asked to meet with me. I agreed, of course, and invited him to our home. I had no idea what would happen next. The man came in, sat down, and told me that he was against the church moving to a property of our own. Then he started in on everything I was doing wrong. He questioned my sermons, my leadership, and even my motives. There was nothing I could say or do to persuade him otherwise. I didn't sleep well that night as the weight of conflict settled on my heart. My ministry honeymoon was over, and I didn't really know what to do. Eventually, I enrolled in a Master's program that featured classes and training in conflict management. And that's when I found out about conflict management tactics that I call GLADIATOR TACTICS. It was a discovery that changed my life and ministry forever. After the Master's program, I became certified in Mediation by the State of Michigan. Then I completed a doctorate in Conflict Management. As the years passed, I remained vigilant, ALWAYS ON THE LOOKOUT FOR GLADIATOR TACTICS through countless mediations, counseling sessions, leadership meetings, and congregational gatherings. 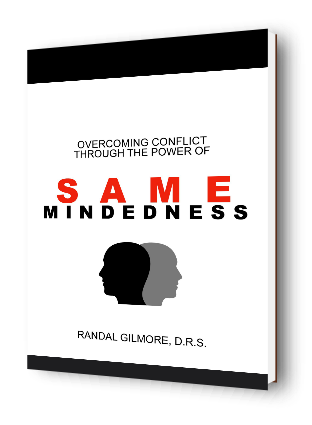 And now I'm sharing them with you FOR FREE in the print edition of "Overcoming Conflict Through the Power of Same-mindedness" (retails for $10 plus shipping on Amazon). JUST TELL ME WHERE TO SHIP YOUR COPY. All I ask is for you to cover the cost of printing and shipping.